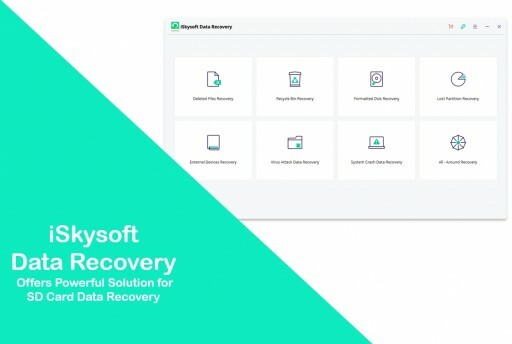 No matter what files are lost because of accidental or intentional deletion, device formatting, system error or virus infection, iSkysoft Data Recovery recovers everything users need from computer and external drives. iSkysoft Data Recovery is a software used to recover the data lost on several devices like SD cards, computers, hard drives, flash drives and more. It is a powerful and reliable data recovery solution that can be used to retrieve data quickly yet efficiently. This data recovery software can retrieve all types of data from a damaged or corrupted drive or SD card easily. iSkysoft data recovery software can be accessed easily from anywhere and at any point in time. The users can save the process, even when the recovery is paused. However, the saved data can later be retrieved automatically. One can also keep an eye on the data being recovered, be it the documents, photos or emails, by using the humanized preview available in the software. The software offers some amazing features that enable the recovery process for over 1,000 types of data on various devices. The software is highly intuitive and helps to recover the data lost in scenarios like system crashes, malicious software, viruses, etc. To recover files from an SD card, a user needs to plug the SD card in a Windows or Mac PC to launch the software at first. iSkysoft Data Recovery was designed keeping the requirements of the user in mind, so, due to this reason, the software is said to be masked with a modest user interface that is interactive and can be used by anyone easily. There are four modes of data recovery that are easy to access. The users can recover all sorts of compatible files from even the newer devices and can also choose information such as photo streams, library data, file attachments, voice memos and more for the recovery. This SD Card Recovery software has two different types of scanning processes for the data recovery - the Quick Scan and the Deep Scan. Quick Scan is a sharp feature that scans the data quickly. It scans data like images, documents, overwritten files and videos effortlessly, whereas Deep Scan features provide higher rates of data recovery by scanning every nook and corner of an SD card thoroughly. It is proficient in recovering the data from the most inaccessible data fragments and devices. The software is one of the tools designed to support data recovery from even an unbootable Windows or Mac PC. This process is also followed by creating easily accessible data files under Win PE environment in Windows. iSkysoft is a leading brand that offers smart software and digital solutions. The company is known to provide tech solutions that make customer satisfaction a priority. Standing high in the industry for the last 10 years, the brand is providing multilingual interaction services for users across 230 countries and continues to spread both enthusiasm and technological updates to every nook and corner of the world. Also, iSkysoft aims to provide more than 100 million users with easy-to-use tools for better digital experiences.